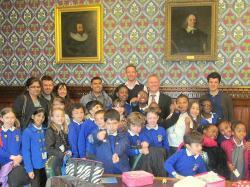 Local MP Steve Reed was questioned by 26 Rockmount pupils during a visit to the Houses of Parliament in Westminster on 13 May. The Croydon North MP, London’s newest MP elected last November, kindly hosted the visit for the school councillors from years 2-5. School councillors are elected by their class mates each year. Each gives a three minute speech about what they want to change and then votes are cast, and the candidate with the most votes is elected. Steve Reed MP said: “I am delighted to welcome you to this amazing building. It is very important that Parliament and the people connect and understand each other.” Asked why he became an MP he said: “It is similar to being on the school council - we want to make things better, things weren’t working. He said one local problem is too much litter on our streets and he’s pushing Croydon Council to do more to clean up the borough and suggested Rockmount might want to support this. After getting the no.3 bus to Westminster, the tour began in the 900 year old Westminster Hall, where many historic events have taken place - legal trials, coronation banquets, fire and speeches. Next stop was the Royal Robing room, where the Queen puts on her crown for the opening of Parliament each year, then into the House of Lords debating chamber. 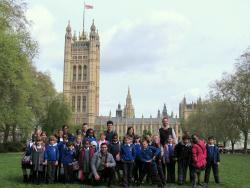 Pupils walked through the voting lobby where votes are cast, and onto the House of Commons chamber. They heard about the various wives of Henry the 8th and the struggle of the suffragettes to get the vote. 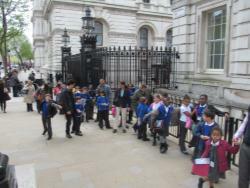 After lunch and a chat with the MP the pupils walked to Downing Street to see the home of the Prime Minister. Aidan, year 4, commented: "I can't believe that we've actually been where the Prime Minister and others MPs work to try and make things better." For many others, the sheer majesty and decoration of the various rooms made for special memories. Liana, year 2, said: "The tables and chairs were made of gold and worth millions of pounds!" After their guided tour, pupils ventured along Whitehall to see the gates of Downing Street and Horseguards Parade before heading back to school. We hope this continues to be an annual trip for school councillors at Rockmount.